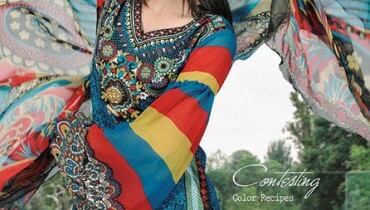 Khaadi winter collection 2012-13 for women was released today. It has a couple of smaller collections. One of them is the Turkish collection. The Turkish collection of Khaadi winter collection 2012-13 includes simple but elegant outfits with intricate prints. This collection is quite different from the Turkish collection since it consists of outfits with striking colors like oranges, reds and pinks. Thus, Khaadi winter collection 2012-13 has something for everyone. Khaadi is a highly renowned brand formed many years ago. It provides a wide variety of outfits for men and women both. For women, it offers stitched and unstitched dresses both. Its dazzling and stylish dresses and high quality fabrics have made it the favorite brand of many people. It releases many new collections in a year. Just recently, Khaadi pre-winter collection 2012 was released and performed well.